Russia is a leader in amphibious aircraft of various classes. RIR chooses three types of Russian hydro aviation crafts that show the most promise. Everyone who attended the Gidroaviasalon 2014 Exhibition in Gelendzhik was convinced that technology has enabled the creation of machines that can fly like an aeroplane and float like a ship on water. As per international standards, the air show in Gelendzhik is very small. There is an open area with airplanes on the shore of Gelendzhik Bay and two pavilions with walls. However, it is only here that any exhibit can “enter” the water directly from a pavilion and display its performance capabilities right before the eyes of the many holiday-makers relaxing on neighbouring Black Sea beaches. This year there were 180 participants in the Gidroaviasalon air show. The Russian Ministry of Defence signed several contracts for the purchase of aviation technology, including 12 Su-30MK’s for the navy. Russia is a leader in the creation of amphibious aircraft of various classes. RIR selected three types of Russian hydro aviation crafts that show the most promise. It looks like a normal airplane. But, in fact, it is a true flying ship. The Be-200 can take off straight from the surface of water as easily as it can from a stationary airfield: the craft’s fuselage has been made like that of a ship and the engine has been moved to the upper part of the wings so it does not get flooded with water. In Soviet times the amphibious plane was made as a rescue craft to be used by the navy. Today it has been “repurposed” for firefighters. In several minutes of skimming across the water it collects 12 tonnes of water in its fuselage, lifts up into the air, and can then release these reserves into the centre of a fire far from shore. The Russian Ministry of Emergency Situations buys the Be-200. Its former head, Sergei Shoigu, is now head of the Ministry of Defence. 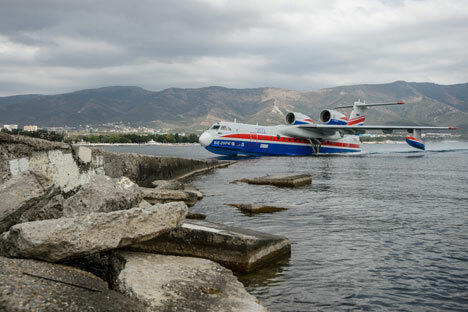 The Beriev Aircraft Company, which is developing the amphibious plane, hopes that the military will take notice of the Be-200 again. At the outset it was designed as a landing or rescue airplane. In contemporary conditions, the amphibian could also become an anti-submarine attack craft. The Ekranoplan – a hybrid between ship and plane – is indisputable Russian manufacturing “know-how.” Cargo capacity was inherited from the first Ekranoplan and speed of movement from the second. In addition, the hybrid is also ecologically safe. In contrast to conventional boats and ships, it flies over the surface of the water like a plane without creating waves that could damage the coastline. It is capable of landing on an undeveloped sloping bank and of “flying” over ice or tundra. The technology of Ekranoplans – ships operating on aerodynamic cushions – was developed by the academic Rostislav Alexeev more than half a century ago. The ships, which looked more like passenger planes, moved over the sea at a certain height thanks to the effect of the aerodynamic plane that allowed them to attain speeds of hundreds of kilometres an hour. In Soviet times, the military used these hybrids. Ekranoplans were designed and built exclusively for military purposes. The Navy Command saw in the airplane-boat the very trump card that would make it possible to reduce to a minimum the USA’s hegemony in the area of connecting aircraft carriers. The Orlyonok landing craft and the Harrier attack had a speed of 311 miles per hour. For comparison, the speed of a US nuclear aircraft carrier does not exceed 43.5 mph. The Orion-14 was shown to the public for the first time. The Ekranoplan was developed within the framework of the program titeld Development of Civil Marine Technology for 2009-2016. New generation composite materials were used in its construction. The parameters of the power train components were substantially improved, a highly reliable transmission was developed and installed, and the on-board equipment was upgraded. The Orion-14 can work in winter in icy conditions where there are ice ridges of up to 20 inches, as well as move across icy slush. The Ekranoplan can be used in the difficult to access regions of the Far North and Far East. Like any other recent military-technology exhibition, Gelendzhik-2014 was not without its unmanned amphibious aircrafts. The new Chirok drone is being developed by the Moscow Research Institute of Radio Engineering (MNIRTI). The Chirok has very high flight performance executed on an air cushion and does not need a prepared airfield, just a sufficiently smooth surface 27.3 yards long, and it can land onshore or offshore. The CEO of the institute, Yuri Nevzorov, said that the wingspan of the remote piloted vehicle is nearly 33 feet long and it weighs just over 1,650 pounds. Its configuration is similar to that of a “flying wing” and it allows for the hauling of a large payload. He said that the creation of a piloted model based on the Chirok but capable of carrying 12 people and having a takeoff weight of over two tonnes is currently being discussed.